Hotel Etiquette: What Can I Take and What Is Stealing? From the Hyatt Place complimentary pens to complimentary soaps and shampoos, there are a number of free things for guest in hotel rooms, but not everything in the room is up for grabs. Most hotels want you to feel at home in your room, so they fill it with nice things. They're so nice, in fact, that you might be tempted to take them home with you, but before you start stuffing your suitcase with goodies, take a minute to learn what's okay and what's off-limits to take home from your hotel room. Among things that are okay to take with you are shampoo, conditioner, body lotion, and other bathroom amenities, bathroom slippers, and stationery, logo pens, notepaper, postcards, and envelopes that are left for your use and can be packed away for later. According to the housekeeping department at Hilton Kingston, guests often take towels and bathroom toiletries, irons, hairdryers, cable boxes, clock radios, blankets, paintings, ashtrays, TV remote controls, pillows, and even the Bible—all of which are not meant to be removed from the rooms. At the Hilton Curacao, guests love the "Hilton Caribbean Breakfast" mugs, which disappear daily, and despite being available in the gift shop, a few people leave the restaurant to "finish coffee in their room" and take the cups with them. A housekeeping manager at the Sheraton Chicago Hotel and Towers also confirmed that the signature "S" crest white pillows and robes often disappear, along with the new coffee makers, which is also the property of the hotel that is not meant to be taken from the room. If you take something from your hotel room, expect an extra charge on your bill. 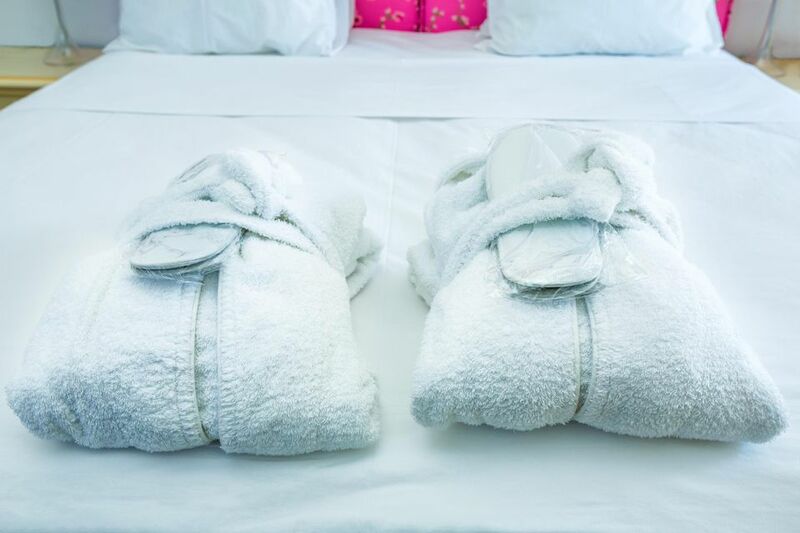 Robes and towels are such popular items for guests to take that many hotels now list the charge right on the hanger and will automatically bill the credit card on file for the extra cost of replacing these items. "A guest room should feel like a home away from home. If the guest enjoys something enough to want to take it home with them, they are welcome to do so, but at a charge. We give guests the option to purchase the items that they are fond of, with everything from the 700 thread count linens and mattresses to the Conrad Miami signature terrycloth and waffle robes." However, the best way to take something home with you is to order it online. Hilton has a website, HiltonToHome, where you can brand-new versions of whatever's in your room, from the soap dish to the Serenity bed. In fact, many hotels have online stores where you can purchase everything from those 700-thread-count sheets and plush towels to the lamps, showerheads, and even the hotel bed itself. The best part is that all of it is brand new and you don't have to worry about fitting it in your suitcase.